Historically I had been responsible for drafting predictions that were often discrete and almost independent of each other. However, in the last 12 months I’ve become a strong proponent of observing market trends and joining their collective impact into bigger and broader industry predictions. I feel that this approach has more value to the ecosystem, that takes to enable the Internet of Things. Flexibility Will Outweigh Performance: eSIM and MVNOs Will Create More IoT Services Value than 5G Providers. The Intelligent Edge and SD-WAN Will Tackle the Distributed Network Performance and Management Issues. IoT Ecosystems Will Evolve into Automated, Intelligent and Interactive Workspaces. IoT Public and Private Market Exchanges Will Emerge Enabling AI-Based Startups to Create Business Outcome Services. The Insurance Industry Will Become the Leading Advocate for IoT Innovation Services Forcing ICT Companies to Play Along. At the base of the predictions pyramid, or a starting point in an IoT ecosystem where the customer or their data is in the center, is connectivity. The deafening drum beat of 5G can be heard. By all accounts every IoT application should be deployed onto a 5G network in 2019. However, while 5G and several key IoT applications are a great fit for each other (video is a perfect example), customers are already testing alternatives which are both good enough from a network performance and business case angles. To that end, 2019 will be a year where e-SIMs delivered by Mobile Virtual Network Operators (MVNOs) will be the defacto on-ramp for many ICT organizations. Layered upon that will be the opportunity to run unlicensed spectrum such as LoRa to greatly simplify the complex issue of connectivity, security and scalability. As more customers scale up their IoT deployments in 2019, distributed architectures become more important as edge computing takes on the new ‘branch office’ layer. To respond to the new network edge, distributed networks become easier to manage with the broader deployment and acceptance of software-defined wireless access networks (SD-WANs). SD-WANs will become the stepping stones for carriers, network equipment vendors, IT and industrial operations to deliver application management performance, and security. In 2019 the discussion of who has the best IoT platform will become irrelevant, as customers who own the IoT data will be asking who has the best ecosystem. IoT data will quickly shift business processes from being stand-alone engagements between suppliers and customers to one of a complete end-to-end solution. Industries such as manufacturing, retail, smart buildings, smart cities, transportation and logistics will all come alive with disruptive business models and services within the ecosystem. This shift will generate a ‘new software’ platform that isn’t owned by a traditional IT software company, but by someone who owns the business relationship with the customer and who can aggregate all of the players onto the platform. These automated, intelligent and interactive workspaces will become a potential battleground between traditional services companies and these new nimble aggregators using SaaS-based platforms to deliver better customer experiences. By late 2019, these ecosystems will become the foundation layer for IoT exchanges whereby business knowledge gained from IoT analytics will be traded or bartered within private or public exchanges. Here, technology such as blockchain will have a very relevant place within IoT solutions. 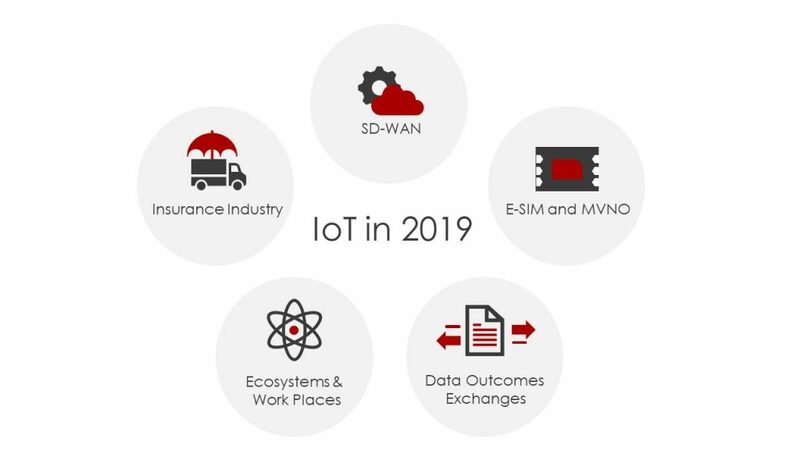 Finally, in 2019 the major insurance companies will rise to become some of the most influential players in making vendors and customers adopt IoT solutions. Knowing that IoT sensors can give detailed information on every aspect of product and customer behavior, insurance companies will exercise pressure on everyone who wants to play within an IoT ecosystem. Anyone who wants or needs some level of product warranty, liability, replacement coverage, service and user behavior insurance will be impacted by IoT-fed actuary tables. Insurance underwriters will ask, seek or have the ability to combine IoT data with Artificial Intelligence (AI), and Machine Learning (ML) integrating the outcomes with Augmented Reality (AR), Digital Twins and 3D-Printing for robotics, drones, autos (or all levels of transportation) across every industry. The influence and impact will be significant and to every intersection of technology and human interface as the high demand for data drives IoT sensor deployment from the base of the network infrastructure all the way to the ecosystem and exchanges. For access to the full report, please follow this link.